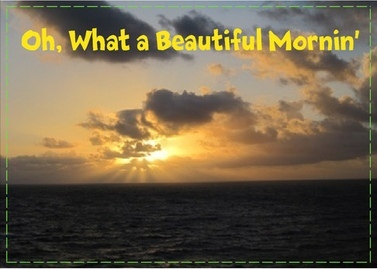 This morning I awoke with this song in my head so I took a picture that I’d taken from the balcony of a ship in the Caribbean at dawn, quickly and easily added the headline and voila! Today’s post! I was never a morning person, but 2 kids later and here I am. I love the beauty of a quiet morning…and I love the beauty of a sunrise ~ the celebration of a new day filled with infinite possibilities! Being that it’s a Monday and in the USA, it’s also Tax Day, I thought I’d try to give you some extra beauty for the start of the week! Spring has certainly spring here as I was rewarded for my early rising with the special sighting of a tiny chipmunk and a little wild bunny who came to visit my patio this morning! I’ve seen Chippy before on my patio, but this was the first sighting of the bunny! I just happened to look up and see Thumper hopping toward my patio door and then he turned when he saw the kitty eyes at the door checking him out! I feel so blessed with the Presents of Presence of today! May your day be blessed with little lucky surprises as well!